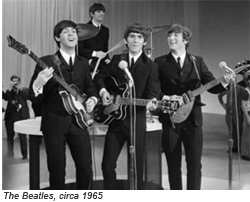 Like most guys in my age bracket, I still remember vividly gathering around a black-and-white TV on a cold February night in1964, to see The Beatles in their first appearance on the Ed Sullivan Show. Wow! The four songs they performed during that first appearance had most of the adults up in arms about the boys’ long hair (at least by the day’s standards), but the kids were bowled over, not only by energy and quality of the performances, but also by the screaming adulation of the hundreds of teenage girls in the show’s audience. Thus began the start of the British Invasion, and sales of musical instruments spiked the world over. The era of the garage band was born! In an attempt to emulate our new heroes, many of us took to learning these electric instruments of the devil, and began assembling various rag-tag assortments of our peers, hoping to learn how to rock and roll! Throughout my teen years, I played in a number of amateur bands, and happily mangled many of the pop hits of the day. An older cousin played drums in a much more ambitious local act, who went on to actually cut a couple of 45s, and garnered some regional notice and airplay. And while they, too, played a fair number of “Top 40” hits, they also peppered their repertoire with music from blues and R&B artists, most of whom happened to be black. It was through listening to these older kids’ interpretations of this music that I got my first taste of “the blues.” And I liked it… a lot! So, while most of my musical peers were listening to and playing music by groups like the Beatles and the Rolling Stones, as well as Cream, Led Zepplin and Grand Funk, I was starting to get drawn into the blues. Initially, my exposure to it came through such British interpreters as Cream, Jeff Beck, the Stones, and John Mayall… who eventually led me to uncover some of their “source” material. Then, I discovered the music of the late, great harmonica virtuoso and band-leader Paul Butterfield, and through him, the master: Muddy Waters! Countless hours of my late teen years were spent listening to his “Sail On” LP, a collection of classics from about 1947 through 1952. For me, this was the mother lode! From the first notes of “I Can’t Be Satisfied” all the way through “Louisiana Blues,” these songs were filled with a raw immediacy that, for me, has never been matched. And I was hooked! Of course, Muddy led me to Little Walter Jacobs, Jimmy Lane (Jimmy Rogers), Howlin’ Wolf, and Willie Dixon, and many others. Digging deeper, I learned about Robert Johnson, Huddie Ledbetter, Blind Will McTell, Lightnin’ Hopkins, Blind Willie Johnson, T-Bone Walker, Blind Blake, and hundreds of others. In any case, my early musical career was relatively short-lived. I played in a number of fine bands, including the Nickel Band; the Moe Lester Orchestra; the Tranter Brothers Band; The Society Casuals and Help’num, both led by the late Fran Kowalski, to name a few… Still, I couldn’t find the right mix of players who really had the same musical interests as me, and I just wasn’t all that keen on playing pop and rock songs in bars every week. So, as college, grad school, career, and later a family, all took hold, I literally abandoned any musical aspirations, selling-off all of my musical instruments and concentrating on my career and on other artistic endeavors (painting). This self-imposed hiatus would last nearly two decades! 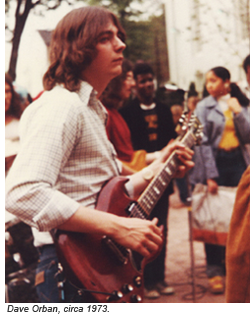 Fast-forward some 17 or so years, when I received a call from Keith Csolak, an old high school bandmate from the Nickel Band days, who was “getting the guys together for a jam session.” As I explained to him, I really didn’t play music anymore, and hadn’t for nearly two decades. In fact, I had no instrument on which to play it, so I told him “thanks, but no thanks.” But Keith was persistent, and showed up at my house the next day with a Mexican Tele and a small, solid-state amp. “You’ve got a week to get ready,” he said. D’oh! I had no idea on how or where to even begin. I remembered nothing, not even how to tune a guitar! Fundamentals like first-position chords had exited my brain years ago, and I didn’t have a clue how to proceed. Nonetheless, I spent the next several days trying to refresh my guitar-playing memory, and listening to some of our old favorite tunes, to see if I could even piece-together something resembling a repertoire. And believe me, the prognosis wasn’t a good one. The weekend finally came, and off I went to Flemington, to see my old bandmates and some friends from back in the day. All of these guys had been playing continuously for 25-30 years, and it showed. They were having a blast recreating some of the magic from our youth, while I sat off to the side, plinking a note here and there, and hoping it had been a “right” one. I was so far out of my league, I had no business even being in the ball park! But one thing was for certain: these guys were all having a great time! And I needed to learn how to become a part of it again! So, with a guitar borrowed from my nephew, I began a journey which continues to this day. Around this time, there was an “open mic night” on Wednesdays at the Merry-Go-Round, a watering hole in nearby Lawrenceville, NJ. I started attending, not to participate, but just to watch. I’d grab a table near the stage, and watch intently as I nursed a drink or three. As each successive guitarist would take the stage, I’d watch what they were doing, and would try to mimic what I saw when I returned home that night. Eventually, I was able to train my eyes, ears, and hands to play some of the basics. Each week brought new musicians and new challenges, but each week, I was able to add to my guitar-playing vocabulary. And after about six months — and several shots of Jack Daniels — I finally had the nerve to put my name on the “open mic” list. It was crunch time! The fellow who hosted the jam was Joe Vadala, a wonderful local singer-songwriter. He was an accomplished musician, but he was also a very sweet guy, one whom I’d gotten to know over the last several months of being a “regular” at the bar. So when it was my time to finally mount the stage and play with the band, he’d gone a long way to making me feel comfortable. And when it was finally my time to “solo,” I had accumulated enough under my belt to actually make it through all twelve measures of a 12-bar blues without tripping all over myself. What I played that night (Stormy Monday Blues) certainly wasn’t “great,” by a long shot. But my playing worked within the context of the song; the crowd seemed to like it; and more importantly, I was hooked. I needed to do this again! I returned week after week, no longer as just an observer, but now as an active participant. Each week meant new musical challenges, and an opportunity to show-off whatever new things I’d learned since the prior week. More importantly, it gave me an opportunity to interact with a ton of different musicians, both amateurs and pros, across a variety of styles. I added a Tuesday night open mic — also hosted by Vadala, at the late Billy Briggs’ Tir Na Nog tavern — to my weekly rounds, enabling me to further hone my chops under different, “unplugged” conditions. Throughout it all, Joe Vadala was incredibly supportive, and helped me to overcome any performance apprehensions I might have had. After a year or two of this, I had developed enough proficiency to want to try something more ambitious… I was ready to start a musical project of my own. One of the good friends I had made at the Wednesday night open mic was Steve Lansing, a younger guy who was extremely talented on both guitar and drums. We batted things around a bit, and decided to put together an acoustic duo act. And thus was born the Mojo Gypsies. I had coined the name because it combined “Mojo,” an old bluesman term for a lucky charm or talisman, and “Gypsies,” because I wanted this new “band” to be a fluid, flexible unit, one that could draw from the talents of whomever happened to be available at the time. 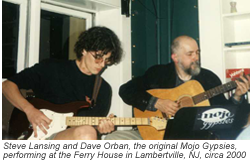 Steve and I started picking-up duo gigs wherever we could find them, first at Bobby Trigg’s original Ferry House restaurant, back when it was still in Lambertville. Here, we’d play for tips and a meal. We also did some private parties, and we continued to hone our act at both the Merry-Go-Round and the Tir Na Nog, whenever we could. We had some great times, to say the least! Eventually, we both joined an electric band called The Rippers, whom we had encountered while playing a mini blues festival at the C’ent Anni Lounge in Trenton. After a couple of fun years of regular gigging with them, I joined the Herd of Blues, another local outfit, where I first played alongside harp man Guy DeRosa. After a couple of years, I left the Herd, wanting to try to launch a band of my own. My musical tastes had evolved, and I wanted to focus more on up-tempo blues and R&B, moving away from some of the harder-edged rocking blues that I had played in many of the bands. There were a couple of false starts with a variety of different players, but I was finally able to recruit a lineup that we could get gig-ready: Jim Quinlan, a bandmate from my high school days, would front the band on harmonica and vocals; another old buddy Keith Csolak on drums; Scott Randolph on bass; and myself on guitar and vocals. We looked around to try and find a keyboard player to round-out the sound, but just couldn’t seem to find anyone with the right musical taste and background, so we decided to go out as a 4-piece. And this was the first lineup for the “electric” Mojo Gypsies! Eventually, this lineup proved to be impractical… conflicts between commitments by the rhythm section to other bands made it difficult to schedule gigs or even rehearsals, so I looked to find some new players to fill these spots. Thus was born the next iteration of the Mojo Gypsies: Jim Quinlan, again fronting on harp and vocals, Marc Helberg on bass; Frank Collabella on drums, and myself on guitar and vocals. Around this time, we added Rick Frank on keyboards. After about a year’s worth of gigs, Frank decided that he would leave the band, as did Rick. Frank was replaced by Don Kloss, who had played drums with one of the various incarnations of The Rippers. Dave “The Brokeback Drummerboy” Nissel, who would ably occupy the drum chair for the next couple of years, until his career sent him to the left coast. We had a lot of fun with Dave (much of it at his expense!). During this period, we were also fortunate to have had the opportunity to play with the great Leo Joseph, a transplanted Australian who was just a fabulous keyboard player. We had a ball playing with Leo until his career called him back to his Australian home. Faced with the prospect of finding yet another drummer, bassist Marc Helberg reached-out to an old friend with whom he’d played before: John Andolino, who jumped right into the breach, and at whose studio we recorded our most recent demo, “The JAM Studio Sessions.” John occupied the drum throne for the next two years, but travel began to take its toll, and he was unable to commit to some of the gigs that were outside of a reasonable travel distance for him. During this period, I was fortunate to have had the opportunity to hold down the guitar slot in James Day‘s fine band, the Fish Fry. Also about this time, we also lost bassist Marc Helberg to his own career demands. Luckily, we were able to fill his frequent absences with the late S teve Duritt, and old friend and longtime bassist for The Rippers. Steve eventually became a permanent replacement for Marc, and he continued until his untimely passing on July 1, 2009. We really miss you buddy! Earlier in 2009, front man Jim Quinlan decided it was time to hang up his harmonicas, and called it quits. Following the “retirement” of Jim Quinlan and the passing of Steve Duritt, I really debated whether to continue on. 2009 had brought many changes, and it was painful to even consider playing without either of my dear old friends. But I finally remembered something that Steve Duritt had once told me… He said, “I’ll be doing this until I drop, because I just can’t imagine not doing it.” So it was time, once again, to build a new lineup. Over the last 15 years, during which I’d also been playing frequently with The Rippers, and I had recruited harp man Guy DeRosa (Herd of Blues) into that band a number of years ago. I asked him if he’d be interested in giving it a go. Drummer Keith Csolak — my long-time friend and the guy who literally dragged me back into this back in ’94 — had filled-in for us on a number of gigs, and was also available. But with Steve’s passing, we had no bassist. Keith was quick to recommend Bruce Bush, with whom Keith had played in a number of bands. We were almost there… but that still left us without a front man. 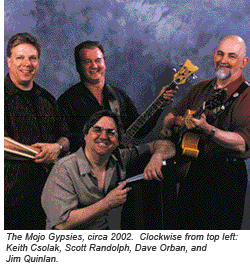 I decided to give it a try, and, after several successful gigs, a “new” iteration of the Mojo Gypsies was born! Fast-forward to 2011, and Bruce decided that it was time to take a break from performing, and elected to go into musical semi-retirement. I was about to throw in the towel in frustration when the great upright player, Jeff “Flourtown Fats” Michael — with whom I had played in James Day’s wonderful Fish Fry ensemble — informed me of his interest to play with the Gypsies. Later in 2011, we were delighted to bring-on Mark Shewchuk — also a Fish Fry alum — on drums. As you can imagine, it was a real treat to re-unite that rock-solid rhythm section and bring their high-caliber firepower to the Gypsies! 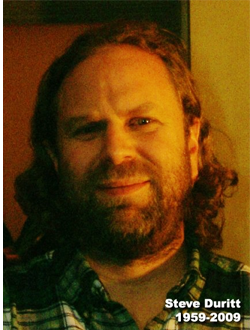 2012 brought about further changes, with Guy DeRosa departing the band. We did a couple of gigs with a rotating line-up of highly-skilled harpmeisters, including James Day and recent transplant from the left coast, Brian Brazil, as well as working with the very talented Russ Lambert (Russ Lambert & his Shake Dancer Band), who shared the spotlight on harmonica and vocals. 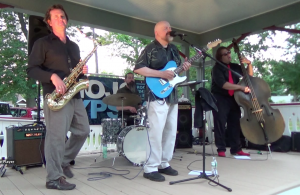 The Mojo Gypsies, circa 2014: Mike Scott on sax, Mark Shewchuk on drums; Dave Orban on guitar and vocals, and Flourtown Fats on bass. In the Spring of 2014, I wanted to expand our stylistic repertoire, and was indeed fortunate to be introduced by Flourtown Fats to Mike Scott, who brings his exceptional skill on the tenor sax (and boyish good looks) to the Gypsies, as we enter the latest chapter in our ongoing musical story. In the Fall of 2016, shortly after the completion of our first CD – I Heard You Twice the First Time – we reluctantly said farewell to Flourtown Fats (aka Jeff Michael), who’d been an important part of the band for more than 6 years. After a lengthy search and much consideration, we were extremely fortunate to enlist the services of Dave Young, who is the latest addition to the Gypsies’ stable, on upright and electric bass and vocals. Needless to say, I am extremely grateful to the many fine musicians who have helped me along the way, with both their tutelage and their friendship. Likewise, the fine musicians who’ve chosen to join me over the years in my little project have helped to make my dream a reality, and have become great friends along the way. Additionally, the family, friends and fans who’ve come to see us play over the years have been a real source of inspiration. And the clubs and venues who’ve taken a chance on us have made it all possible. I thank you all! So, today, true to my original vision, the Gypsies have continued to flourish, through good times and through bad, by pulling-together like-minded individuals with a love for performing some of the world’s best music! It’s been tremendous fun for us, and we certainly hope you enjoy it, as well!